Does the second season of the Claws TV show on TNT have you in its clutches? As we all know, the Nielsen ratings typically play a big role in determining whether a TV show like Claws is cancelled or renewed for season three. Unfortunately, most of us do not live in Nielsen households. Because many viewers feel frustration when their viewing habits and opinions aren’t considered, we’d like to offer you the chance to rate all of the Claws season two episodes here. **Status update below. 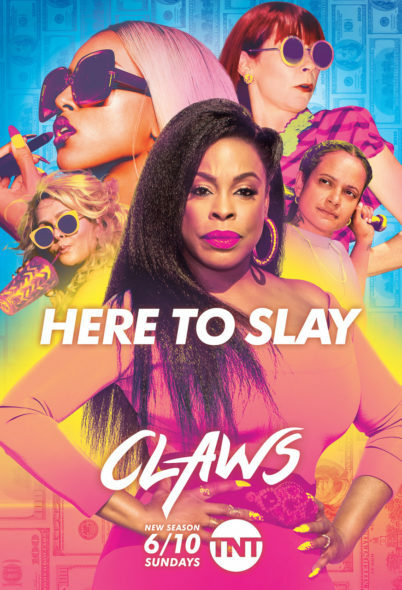 A dark TNT dramedy, Claws stars Niecy Nash, Carrie Preston, Harold Perrineau, Jenn Lyon, Judy Reyes, Karrueche Tran, Jason Antoon, Kevin Rankin, Jack Kesy, Jimmy Jean-Louis, Suleka Mathew, and Dean Norris. The story centers on the diverse and dangerous staff of the Nail Artisan of Manatee County salon, which launders money for the Dixie Mafia. In season two, Desna (Nash) and her crew also have to deal with the Russian mob. What do you think? Which season two episodes of the Claws TV series do you rate as wonderful, terrible, or somewhere between? Should TNT cancel or renew Claws for a third season? Don’t forget to vote, and share your thoughts, below. **7/2/2018 Status Update: Claws is renewed for season three on TNT. Details here. More about: Claws, Claws: canceled or renewed? I really enjoy the raw humor and day to day antics of real life that people should see how hard life can be if your not handed life to you and you have to work for everything even if it means getting dirty sometimes… Love how tv puts a spin on everything.